The patented Freeze Check™ consists of a clear, temperature-sensitive solution sealed in a transparent bubble that covers a green circle with a checkmark. The temperature-sensitive liquid is a multi-component, environmentally friendly solution. When the solution is exposed below the critical freezing temperature, the multiple components interact with each other and the clear solution turns white or opaque. The opaque material obstructs the view of the green circle, thus creating a visible sign that the package has been frozen. Currently, two (2) products are marketed, 0°C (32°F) and -5°C (23°F). Freeze Check technology is available in the 0°C to –5°C range. The low profile packaging configuration makes Freeze Check™ ideal for placement on primary or secondary packaging, providing a reliable visual indication of temperature exposure. Further, the flexibility of the packaging is ideal for non-uniform packaging such as drums. 1.The Freeze Check™ product is self-activating. Simply attach the Freeze Check™ indicator by peeling the release liner off the back, and adhering it to a clean, dry surface. 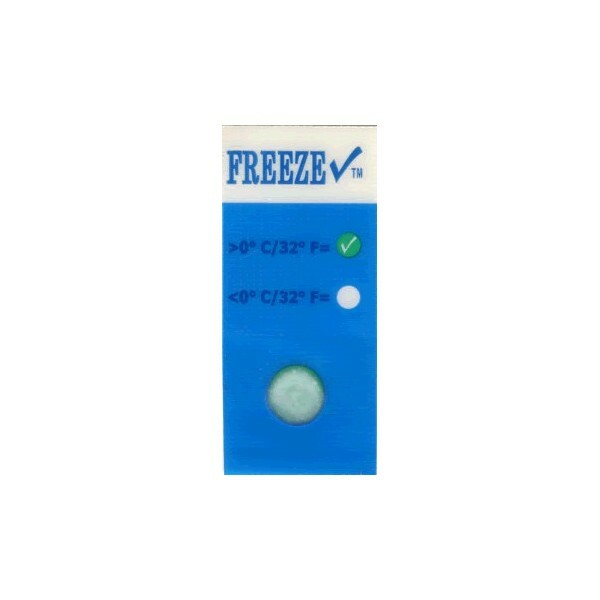 2.Upon receipt of a shipment being monitored by Freeze Check™ indicators, to detect if the product has been exposed to freezing temperatures, observe the Freeze Check™ indicator (prior to reading Freeze Check™, the indicator should be above freezing temperatures for at least ten minutes). If any part of the activation area is opaque (white), your product has been exposed. If still uncertain, press the activation area with your fingertips to evenly distribute the white particles (it is not necessary to remove Freeze Check™ from packaging). To prevent premature activation, keep from freezing prior to use. Storage in a controlled environment such as room temperature or refrigeration is suggested.